It is not a fun experience to own a vehicle that is inconvenient to drive. 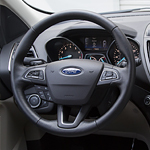 You won't experience inconvenience with the Ford Escape available from Candy Ford in Charlotte. The Escape is designed by Ford's engineer's to provide several convenient features and a lot of space. One of the most convenient features of the Ford Escape is the vehicle's cargo space. With all of the seats up, the Escape has 34 cubic feet of cargo space. If you place both back seats down, the cargo capacity increases to 68 cubic feet. You also have the added convenience of the 60/40 split seat so that you can carry more cargo and still have a passenger in the rear. The Ford Escape also features a convenient rear camera. This camera allows you to clearly see what is behind you when you are backing up in a parking lot or down your driveway at home.